In the working class district of Haversham, Squeak saves a company and dooms himself to poverty until a benefactor gives him a second chance. Thus we follow a poor cripple’s unlikely rise – but for what purpose? The Whitechapel Gambit is a rather interesting take on the Steampunk sub-genre where the author focuses less on the extravagance of a Victorian steam empire and more on the underbelly – the poor and unfortunate, the seedy and the criminal. And in our tour of the less savoury, we also see the corruption of power and the unrelenting thirst of revenge. I admire the approach the author has taken to reveal this world to the reader. There’s never an explanation of how this world is made up; the reader discovers it in pieces. And it’s quite an interesting world to explore with quite a bit of scope for future novels. I also like the way the author only focused on what was deemed important to the story. We’re not marched down endless tangents only to wonder in the end what purpose they served. Instead we’re participants in a focused story that admittedly starts with some confusion but is slowly resolved. Having said that, parts of the execution did give me some concern. The structure of the story itself I felt lacked a little clarity. The first part of the book follows to narrative up until a certain point. Then the second part seems to follow-on from this briefly until we’re suddenly – without any warning – hit by a parallel timeline narrative. I found myself completely disoriented for a chapter or two before I adjusted and that was somewhat damaging to my overall enjoyment of the story. So to prevent a similar shock to potential readers, there are two narratives we follow in the book. One with Squeak as a young child and one some years further on with Squeak as an adult. The introduction of Squeak’s adult phase will arrive suddenly, so remain calm, continue breathing and equilibrium will return. Additionally, the author introduces a chess metaphor somewhere in the second part of the book and that metaphor carries through to the ongoing chapter headings. It’s rather clever once it gets going, but it gave me pause. I felt like the author had this great idea of creating a narrative that was represented by moves in a chess game. However, not all of the story could fit into the metaphor so an initial chunk of the book followed a different structure. It lent the story a certain air of disjointedness. Once I got myself over the structural hurdles though, there really wasn’t much to complain about. I’ve already mentioned that I enjoyed the world and how it was revealed to me. I enjoyed the irrepressible Squeak, the mysterious Sir Nicholas and the various other characters key to the story. I enjoyed the plot as it become clear although it might have been nice for the machinations to have been a little more intricately woven. I enjoyed the actual Steampunk elements (because that’s how I roll) and I did find the conclusion satisfying in its ambivalence. 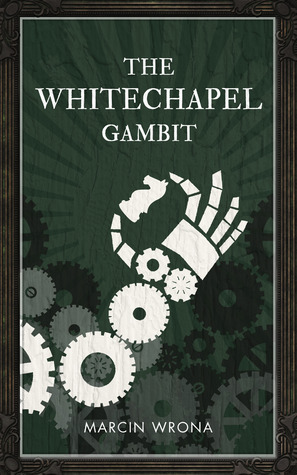 I think if you already like Steampunk, you should add The Whitechapel Gambit to your list. It doesn’t wallow in steam-powered pseudo-futuristic gadgets and industry as much as it could have, although the trappings are definitely there. However, its focus on subjects like colonisation and class division while still giving you all the greed, plotting and revenge you could want make it an interesting take on this sub-genre and worthy of consideration. This entry was posted in 3.5, Fantasy, Novel, Reviews and tagged Fantasy, Steampunk. Bookmark the permalink.